The annual Country Living Expo and Cattlemen's Winterschool is the PNW region's premier family-friendly educational event offering an array of country living classes to the public as well as an opportunity to network with small farmers, professors, business people, and subject matter experts in olde time and ag-related topics. Our centrally-located Trade Show will be open all day long. Dr. Temple Grandin is the keynote speaker. Snohomish Conservation District, along with other surrounding conservation districts, will have two booths in the trade show. Select from 170 classes (62 new) and enjoy our popular smoked prime rib lunch. A vegetarian option is also available. So whether your interest relates to livestock/equine/poultry/bees; cooking/baking/food/canning; nature/pasture issues/trees/mushrooms/gardening; fiber; and skill building such as arc welding and arts & crafts, there are classes for you! For 2019 we welcome back Dr. Temple Grandin as our keynote speaker. 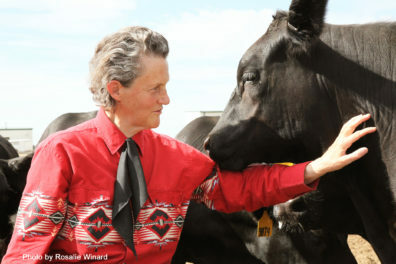 Dr. Grandin is a professor of animal science at Colorado State University, an author, an autistic activist, a consultant to the livestock industry on animal behavior, and an engineer. She will be speaking at the Expo during Sessions #1 and #5. Dr. Grandin will also be speaking Friday, January 25, at 7:00 PM at Everett Civic Auditorium (see our website to purchase tickets to the Everett lecture). For 2019 we also bring you a second keynote speaker, Steve Fransen, Ph.d. Dr. Fransen serves as Forage Crop Specialist; Associate Crop Scientist within the Crop and Soil Sciences Department at WSU. He works at the Irrigated Agriculture Research and Extension Center In Prosser, WA. Dr. Fransen is a published author and guru grass farmer. If you’re interested in sustainability and the environment, take his 2-hour class on the best grass varieties for drought conditions and management strategies for dry times. Come join over 1200 of your neighbors for a day of learning, sharing, and great joy. See you bright and early January 26, 2019! ONLINE REGISTRATION HAS CLOSED. Tickets will be available at the door. Here are the classes being taught by Snohomish Conservation District staff at the Expo on January 26, 2019. Learn about this holistic system of farming that focuses on the farm as an agro- ecosystem. Using adaptive management and an understanding of the multi-functionality of the farm system will allow you to utilize techniques to improve soil health, water quality, and biological diversity. Creating a regenerative agriculture system mimics nature, making use of natural processes and ecosystem services to the grower’s advantage. Learn also how this form of farming is being looked at as a land use option for carbon sequestration, turning farmlands into part of the climate change solution! A well‐maintained working tractor is the mainstay of many small farms. Learn routine preventative maintenance to keep your tractor starting up on the first turn. This will be a two-part class. In the first session we will learn how to use the runoff from your existing roofs for livestock watering, garden irrigation and emergency storage. We will explore key components for every collection system, as well as some of the more unique considerations specific to agricultural uses. All are welcome, whether you are just considering a 50 gallon barrel or want to do a 100,000 gallon cistern. Time: 10:15 a.m. to 11:15 a.m. In the second session we will help you build a 55 gallon rain barrel to use at your own house. You will not need to bring any tools or parts for this class, but will need to have enough room in your car to take the barrel home. We can typically fit a barrel in the back seat of a sedan. The first class is at no additional charge. The second class costs $50 to cover the cost of the rain barrels and is limited to the first 30 people registered, who take their barrel home. Anyone is welcome to watch the-build-your-own rain barrel at no charge. Moderator: Bobbi Lindemulder, Cattle Producer and Snohomish Conservation District Farm Planner. Join seasoned cattle producers for a discussion of a variety of ways to successfully raise beef cattle in Western Washington. Whether you want to raise a couple or many, this class will help get you going, move your existing operation forward, or plan for expansion! Topics include: breeds, setup, management, marketing and more! In this class you will learn how to overcome many of the challenges we face as horse owners and keepers in the western Washington - specifically related to mud, manure and pasture problems. We all read interesting and unique solutions to horse care in the many journals and magazines we read, but Western Washington presents some of the most challenging issues in keeping horses because of its unique climate and ecology - faced nowhere else in the United States. So, any solutions to these issues must be specific and unique to this area. Join Michael as we discuss the various unique and specific ways we overcome the challenges here and keep our horses and our land safe and healthy. Project Harvest aims to increase access to nutritious food in our region by connecting local farmers, food banks, and volunteers to get fresh, local produce into the hands and bellies of the food insecure in our communities. Access to fresh produce is particularly hard for those on a limited budget and you can help make nutritious, fresh produce more accessible to all. Project Harvest recruits and trains volunteers to grow and/or harvest surplus produce. Whether you’re planning this year’s garden and want to ‘grow an extra row for the food bank’ or thinking of gleaning area farms and orchards, this class provides the resources needed to get started and engage your neighbors in a great family activity.